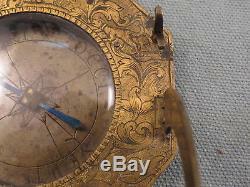 This is referred to as a Universal Equatorial, Equinoctial or Augsburg Dial. 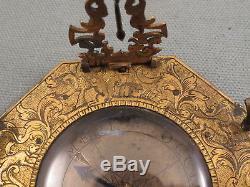 If you are familiar with these you will notice that the engravings with the house, squirrel, dogs, and bird are much finer and more artistic than the average Augsburg Dial. This is a Masterpiece work from Vogler. Even the spring plate on the base has an interesting character engraved on it. Johann Vogler established himself as a Compass Maker in Augsburg before 1745 becoming famous for his Equinoctial Dials before dying in 1765. His Brother Andreas Vogler was made a Burger on May 31, 1766 and took over Johann's workshop. 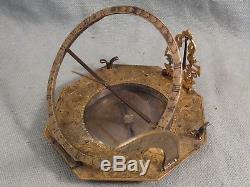 He also specialized in Augsburg-type Equinoctial Dials, but made other types also. It is 100% complete and functions perfectly. 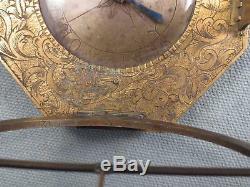 Two of the feet are adjustable to level the sundial and the little ears on them serve to keep the ring held in place for travel. 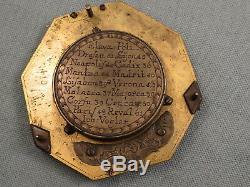 The table of latitudes on the back is more detailed than most with many more cities listed. It appears most are in France or Italy. 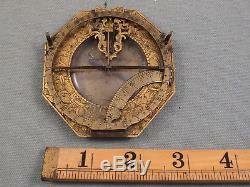 Universal Equatorial, Equinoctial or Augsburg Dial. The hour scale is designed to be parallel to the Equator, and when the Sun is exactly over the Equator it indicates the time of the Vernal or Autumnal Equinox, hence the basic names given to this dial. Adjustable for latitude it as a popular type made in large numbers, especially in Augsburg, Germany, during the late 17th and 18th centuries. 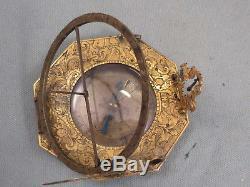 It is usually made of brass, and in its German form is often eight- sided. 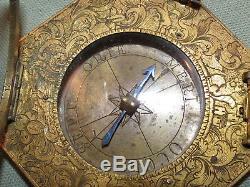 In the base is a magnetic compass, and on the South side there is generally a leveling bob in a hinged frame. On the West side is a curve arm engraved with degrees of latitude. The hour scale is cut on the inside of a thin ring, and since it is equatorial, the divisions are all equal at 15 to one hour. The gnomon is a needle on a cross bar which can be turned so that the needle is at right angles to the rung. Everything hinges for packing into a fishskin case to go in the pocket. 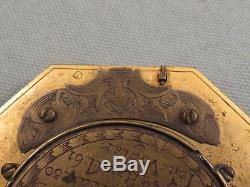 A perpetual calendar can be an addition to the lid of the case. 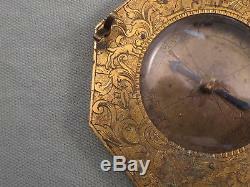 Some of the 18th century Augsburg craftsmen who made this type of dial are Nicolaus Rugendas, Johann Georg Vogler, Andreas Vogler and Ludwig Theodatus Muller. Two 18th centruy Parisian makers are Claude Langlois ad Marcquart & Cadot. All of our items are very securely packed. US Postal rates increased a lot this year. Thanks for looking, and GOOD LUCK! I try to keep them as manageable as possible. Unfortunately, some international buyers are NOT playing fair. Its strange how all of a sudden, people aren't getting their stuff. There will be no exceptions. We also will not falsify. This is against the law and subject to penalty. If we have done good honest business in the past this will not be necessary. 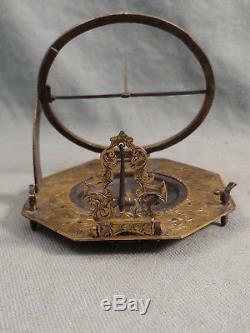 The item "Rare 18th Century Equatorial-Equinoctial Sundial-Compass, Augsburg Dial Timepiece" is in sale since Wednesday, January 30, 2019. 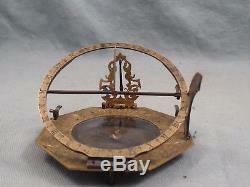 This item is in the category "Antiques\Science & Medicine (Pre-1930)\Scientific Instruments\Other Antique Science Equip". The seller is "combolox" and is located in Fairfield, Montana. This item can be shipped worldwide.